Perhaps only second to enjoying the ride in person, horse back riding pictures capture the essence of freedom you can experience while sharing time with your favorite equine partner. 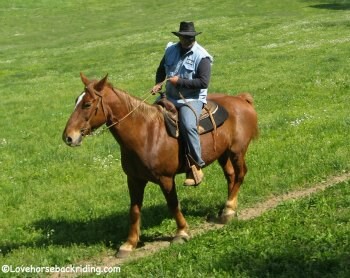 Heading out on the trails is one of the best ways to enjoy your time on horseback. 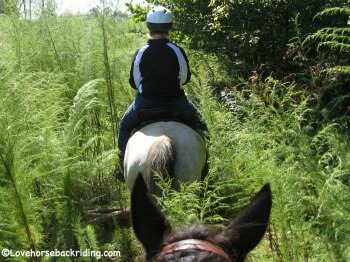 In this picture these riders are making their own trail through the very tall bushes. This rider is hitting the trail in traditional western tack. He is a trail guide, taking those that have rented a mount for an hour out into the Kentucky hills for a one of a kind experience. 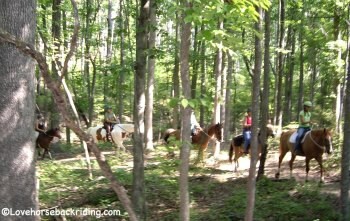 Whether it is heading to the show, lesson or trail ride together nothing beats horse back riding with friends. 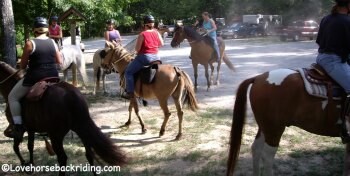 In these two pictures, a natural riding group is heading out on an organized group ride. Out in the woods and enjoying some time with friends and their favorite partners! I hope you have enjoyed these pictures and hope that it makes you want to head out and see your own equine partner! Sprint on back from horse back riding pictures to the index page.